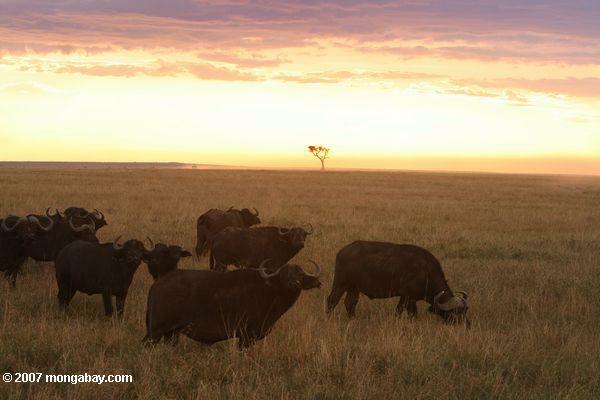 African buffalo at sunset in the Maasai Mara, the Kenyan side of the world famous Serengeti plains. Photo by: Rhett A. Butler. A planned road in Tanzania threatens to cut through Serengeti National Park, the southern end of one of Africa's greatest spectacles. While the government says the road will not impact wildlife, world-renowned conservationist Richard Leakey argues that the road will eventually 'kill the migration' of wildebeest and other animals that powers the savanna's ecosystem every year. The African Wildlife Foundation (AWF) has proposed two alternate road routes to save the Serengeti. Medical and scientific writings of the explorer, doctor and missionary.